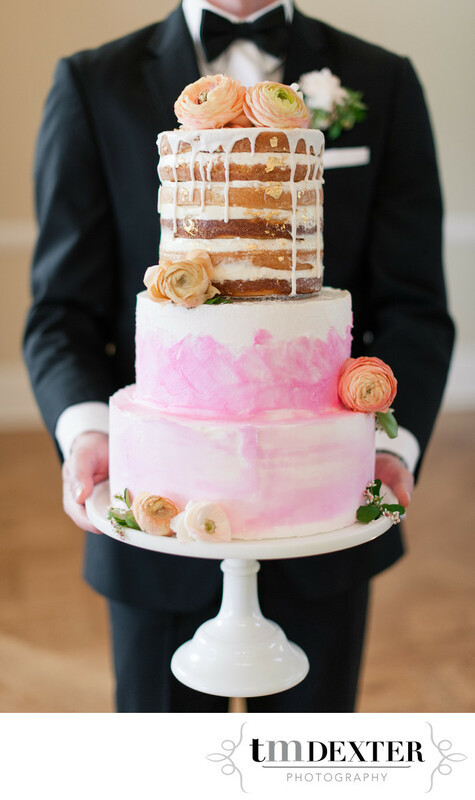 This gorgeous wedding cake was made by the talented baker at Salted Sweets. It was part of our styled wedding shoot this spring at Flying Horse Ranch, just 30 minutes north east of Colorado Springs. We're really lucky that we get to work with so many top wedding vendors in the Colorado Springs area. To pull of this shoot, I worked with Ileen Hoekman, owner of Once Upon a Wedding Events. She's an excellent wedding planner an did such a wonderful job putting things together. We also got to partner with Quintessential Events who did the beautiful bride's bouquet and reception florals, and A Love Tale who provided styling and props. We also had a great videographer, invitation designer, hair and makeup artist. As a wedding photographer, I really enjoy the chance to participate in a styled shoot every so often. It gives us the chance to slow down and take our time photographing gorgeous details in new ways, something we don't typically get to do on a regular wedding day. I think the theme we chose went very well with the feel of Flying Horse Ranch. We used soft pink and gold, as well as peonies to decorate the tables. Location: 9663 E Palmer Divide Ave, Larkspur, CO 80118.